Regardless of appearance, a guinea pig needs exercise to maintain optimal health. Time outside the living enclosure to explore surroundings can be the highlight of your cavy's day. Cater to his natural instincts and encourage exercise both in and out of the cage by providing him a companion. Let him explore new shelters often, and encourage him to forage. Keeping two or more guinea pigs together will promote exercise. Guinea pigs are herd animals that almost always enjoy the company of other cavies. Having a playmate allow them to have fun inside their cage even when you are not available to interact with them. And having another cavy to chase around during playtime outside the cage is a healthy for of exercise for these critters. Companion cavys should be of the same gender, or spayed or neutered, to prevent pregnancy. As prey animals, guinea pigs instinctively seek shelter that can protect them from danger. Placing a hideaway house or other safe item that your pet can explore and crawl into on the floor of his play area -- like a brown paper bag, a commercially sold tunnel made for guinea pigs, PVC pipe or an upside-down cardboard box -- will add an element of surprise to his exercise time, thereby increasing the fun factor. Change these temporary shelters often to encourage your guinea pig to get active. Give your guinea pig something he can investigate nose-first. Presenting your piggie with a small ball on the floor of his cage or play area in your house can help increase his motivation to play once he discovers that a nudge from him nose will keep the fun times rolling. A little ball with a bell inside, such as those marketed for cats, will serve well because it's light. Roll the ringing thing across the floor and see if it piques your cavy's curiosity. Like the rest of us, guinea pigs can be strongly motivated by food. Exercise time might become worthwhile to the pet if you hide some healthy treats around the area designated for cavy floor time. Placing a piece of carrot inside a paper bag, for example, will provide your pet a fun surprise as he goes exploring. You can break up a store-bought guinea pig treat and place the small pieces inside a cat ball that has open slots so that pieces are released onto the floor as he pushes the ball around. 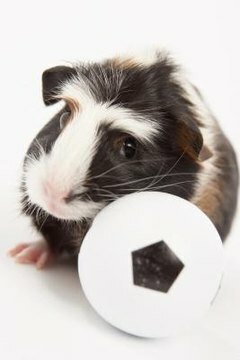 According to the PetSmart website, stuffing toys with treats will cater to your guinea pig's natural foraging instinct. Chew toys specifically designed for guinea pigs can serve as exercise aids whether your pet is in or out of his normal habitat. Being able to chew is an important aspect of a guinea pig's health because his teeth are always growing and need to be worn down. Sterilized pine cones and untreated apple tree branches facilitates exercise of a sort that's fun for the cavy, as can chew sticks formed from various seeds and nuts, sold in pet stores. Timothy hay is a favorite guinea pig treat and one the cavy can burrow under and relax in. Hay is also a necessary staple in your cavy's diet due to its ability to promote digestive health. Provide it in unlimited quantities.